Salon and Spa beauty supply FREE Shipping on EVERYTHING!!! We are a provider of Esthetician - cosmetology supplies, accessories and essential equipment for Spa, Salon and Day Spa. We manufacturer Cosmetic and Skin Care Brushes, with over forty years of service to the industry. We provide a large variety of esthetician - cosmetology supplies including professional skin care tools, disposables, robes, clothing and much more. Esthetician supplies, Spa and Salon accessory items have made Teka Fine Line Brushes the upscale brush manufacturer we are today. Our private label and wholesale programs offer a variety of formats to include stamping, embroidery and packaging and others. We are also known for supplying spa and salon equipment. Disposables, Salon, Spa and Day Spa Essentials and Accessories complete our product menus. Whether we manufacture brushes or distribute cosmetology supplies and accessories, our customer is a winner of quality products. Our philosophy is to provide quality and ethics to all our customers that are evident in all the brushes we manufacture. We make our skin care brushes plus our cosmetology brushes from premium quality components. Our hair, handles and ferrules make the TEKA Brush what it is today, a sought after long lasting product that does what it is supposed to do. Our expertise allows us to provide businesses, estheticians and cosmeticians with a broad range of private label options. Some of the private label options are handle length, handle color, stamping color, packaging and others. Personal or professional needs of estheticians are served from our philosophy of a good Spa accessory or Supply product. Our product does what it is supposed to do. Product/s are easy to reorder for spas and day spas by the spa, day spa, esthetician, cosmetician or for personal use. We believe this is the only way to obtain and maintain satisfied clients. Someone said there is nothing left to say when the job at hand is done right the first time. We feel there is one thing left to say, THANK YOU. You now know just a few of the reasons why many people turn to TEKA for Salon, Spa and Day Spa essentials, tools and accessories to satisfy their needs. 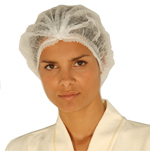 Non-irritating 21" expansion hair cover to protect and hold hair during makeup applications and or skin care treatments. Especially during microdermabrasion and other skin care treatments is the value of our hair cover proved. Danielle offers insight. Our chrome covered sensuous silver bullet is a red sable mini angular shadow liner applicator brush. We use pure red sable and hi-impact chrome bodies to offer a sleek covered and coveted cosmetic brush. Uses range from 1-Mineral Cosmetics, 2-Foundation, 3-Treatments, 4-Mask, 5-Latex & other especially thick applications, 6-General Cosmetics and other treatment application areas. CERAMIC BOWLS (one size) 1 3/16" deep x 1 5/8" diameter. Use these bowls in your procedures and treatments when you require a manageable size. Bowls are priced each color. Specify color selection. All delicious pastels allow for embroidery to tease the novice or experienced robe buyer. 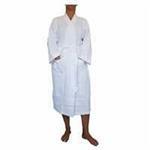 48” 60/40% cotton/poly waffle weave robes with trim lining on pockets, sleeves and collars... Robes wash easy and wear well. Danielle supports good wear. Our brow and lip waxing spatula applies thinner covering films of wax products. Other benefits include blending cosmetic products or foundations while maintaining color integrity. Easy to clean and serilize are desirable benefits. Poly bagged individually. Sized at 20 ¼ X 29 ¾ with a SCOOP NECK. Made with a one ply water resistant poly liner. Feel it is time to be treated properly? Time to be overjoyed and spoiled with quality? Email, call, write or fax and be properly spoiled with immediate attention to your needs.